I’m very pleased to (belatedly) announce the release of Epiphany 3.32 and WebKitGTK 2.24. This Epiphany release contains far more changes than usual, while WebKitGTK continues to improve steadily as well. There are a lot of new features to discuss, so let’s dive in. The address bar is a central component of the user interface, and this clean design is important to provide a quality user experience. It should also leave a much better first impression than we had before. Epiphany 3.24 first added a tab menu at the end of the tab bar. This isn’t very useful if you have only a few tabs open, but if you have a huge number of tabs then it’s useful to help navigate through them. Previously, this menu only showed the page titles of the tabs. For 3.32, Adrien has converted this menu to a nice popover, including favicons, volume indicators, and close buttons. 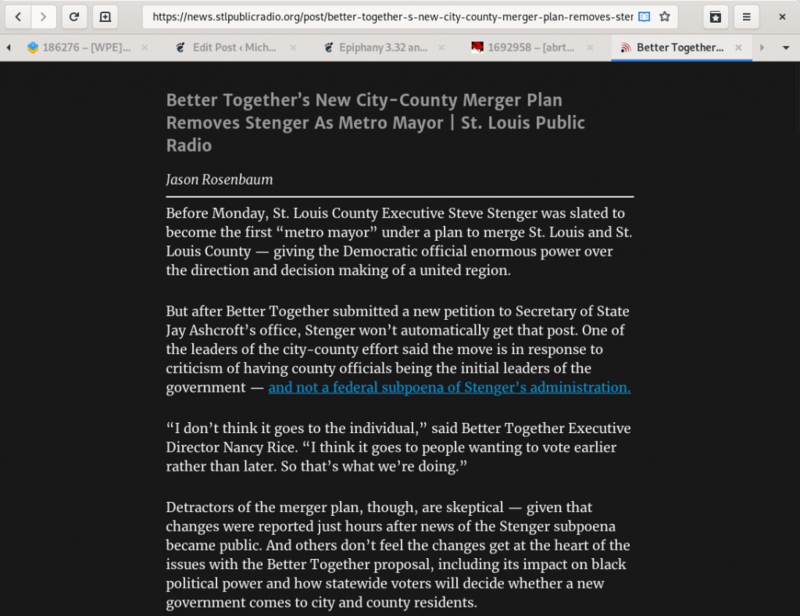 These enhancements were primarily aimed at making the browser easier to use on mobile devices, where there is no tab bar, but they’re nice improvement for desktop users, too. Applications that depend on WebKitGTK 2.24 may opt-in to these gestures using webkit_settings_set_enable_back_forward_navigation_gestures(). Alexander also added pinch zoom. There was no code to prefer emoji fonts for rendering emoji, meaning emoji would almost always be displayed in non-ideal fonts, usually DejaVu, resulting in a black and white glyph rather than color. Carlos fixed this, too. This seems to work properly in Firefox on some websites but not others, and it’s currently WONTFIXed in Chrome. It’s good to see WebKit ahead of the game, for once. Note that you’ll see color on this page regardless of your browser, because WordPress replaces the emoji characters with images, but I believe only WebKit can handle the characters themselves. You can test your browser here. First introduced in 3.30, Adrien has continued to improve adaptive mode to ensure Epiphany works well on mobile devices. 3.32 is the first release to depend on libhandy. Adrien has converted various portions of the UI to use libhandy widgets. Jan-Michael’s reader mode has been available since 3.30, but new to 3.32 are many style improvements and new preferences to choose between dark and light theme, and between sans and serif font, thanks to Adrian (who is, confusingly, not Adrien). The default, sans on light background, still looks the best to me, but if you like serif fonts or dark backgrounds, now you can have them. Wait, JPEG 2000? The obscure image standard not supported by Chrome or Firefox? Why would we add support for this? Simple: websites are using it. A certain piece of popular server-side software is serving JPEG 2000 images in place of normal JPEGs and even in place of PNG images to browsers with Safari-style user agents. (The software in question doesn’t even bother to change the file extensions. We’ve found far too many images in the wild ending in .png that are actually JPEG 2000.) Since this software is used on a fairly large number of websites, and our user agent is too fragile to change, we decided to support JPEG 2000 in order to make these websites work properly. So Carlos has implemented JPEG 2000 support, using the OpenJPEG library. This isn’t a happy event for the web, because WebKit is only as secure as its least-secure dependency, and adding new obscure image formats is not a step in the right direction. But in this case, it is necessary. With this, I find myself closing tabs by dragging the mouse down and then to the right. Down and back up will reload the tab. Straight to the left is Back, straight to the right is Forward. Straight down will open a new tab. I had originally hoped to use the right mouse button for this, as in Opera, but turns out there is a difference in context menu behavior: whereas Windows apps normally pop up the context menu on button release, GTK apps open the menu on button press. That means the context menu would appear at the start of every mouse gesture. And that is certainly no good, so we’ve opted to use the middle mouse button instead. We aren’t sure whether this is a good state of things, and need your feedback to decide where to go with this feature. A cool side benefit of using libdazzle is that the header bar is now available in fullscreen mode by pressing the mouse towards the top of the screen. There’s even a nice animation to show the header bar sliding up to the top of the screen, so you know it’s there (animation disabled for fullscreen video). Some users were disconcerted that the new tab button would jump from the end of the tab bar (when multiple tabs are open) back up to the end of the header bar (when there is only one tab open). Now this button will remain in one place: the header bar. Since it will no longer appear in the tab bar, Jan-Michael has moved it back to the start of the header bar, where it was from 3.12 through 3.22, rather than the end. This is mostly arbitrary, but makes for a somewhat more balanced layout. The history of the new tab button is rather fun: when the new tab button was first added in 3.8, it was added at the end of the header bar, but moved to the start in 3.12 to be more consistent with gedit, then moved back to the end in 3.24 to reduce the distance it would need to move to reach the tab bar. So we’ve come full circle here, twice. Only time will tell if this nomadic button will finally be able to stay put. 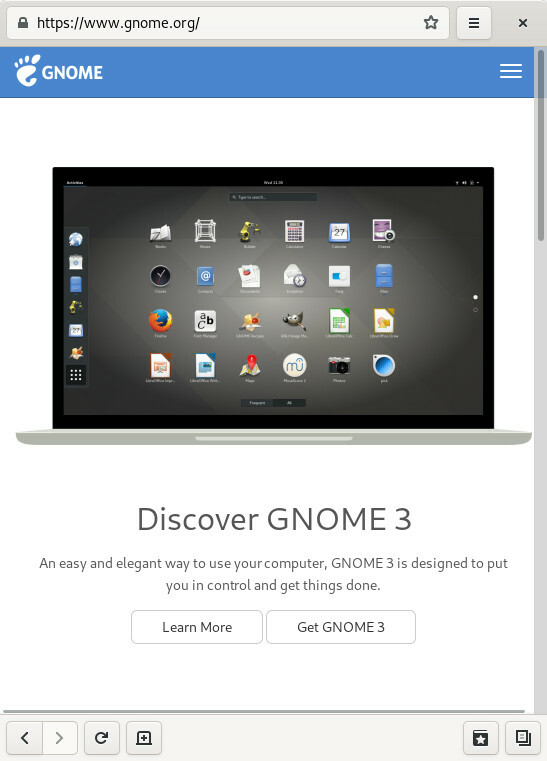 Yes, most GNOME applications have a new icon in 3.32, so Epiphany is not special here. But I just can’t resist the urge to show it off. Thanks, Jakub! It’s impossible to mention all the improvements in 3.32 in a single blog post, but I want to squeeze a few more in. Alexander (Exalm) landed several improvements to Epiphany’s theme, especially the incognito mode theme, which needed work to look good with the new Adwaita in 3.32. Jan-Michael added an animation for completed downloads, so we don’t need to annoyingly pop open the download popover anymore to let you know that your download has completed. Carlos Garcia added support for automation mode. This means Epiphany can now be used for running automated tests with WebDriver (e.g. with Selenium). Using the new automation mode, I’ve upstreamed support for running tests with Epiphany to the Web Platform Tests (WPT) project, the test suite used by web engine developers to test standards conformance. Carlos also reworked the implementation of script dialogs so that they are now modal only to their associated web view, not modal to the entire application. This means you can just close the browser tab if a particular website is abusing script dialogs in a problematic way, e.g. by continuously opening new dialogs. Patrick has improved the directory layout Epiphany uses to store data on disk to avoid storing non-configuration data under ~/.config, and reworked the internals of the password manager to mitigate Spectre-related concerns. He also implemented Happy Eyeballs support in GLib, so Epiphany will now fall back to an IPv4 connection if IPv6 is available but broken. Now Contains 100% Less Punctuation! Did you notice any + signs missing in this blog? Following GTK+’s rename to GTK, WebKitGTK+ has been renamed to WebKitGTK. You’re welcome. Although Epiphany 3.32 has been the work of many developers, as you’ve seen, I want to give special credit Epiphany’s newest maintainer, Jan-Michael. He has closed a considerable number of bugs, landed too many improvements to mention here, and has been a tremendous help. Thank you! Jan-Michael has recently changed Epiphany Technology Preview to use a separate app ID. Instead of org.gnome.Epiphany, it will now be org.gnome.Epiphany.Devel, to avoid clashing with your system version of Epiphany. You can now have separate desktop icons for both system Epiphany and Epiphany Technology Preview at the same time. …and move your personal data from the old app to the new one. Then don’t forget to make it your default web browser under System Settings -> Details -> Default Applications. Thanks for testing Epiphany Technology Preview! One guess which of those we’re going to be talking about in this post. Yeah, of course, libsoup! If you’re not familiar with libsoup, it’s the GNOME HTTP library. Why is it called libsoup? Because before it was an HTTP library, it was a SOAP library. And apparently somebody thought that when Mexican people say “soap,” it often sounds like “soup,” and also thought that this was somehow both funny and a good basis for naming a software library. You can’t make this stuff up. OpenSSL is by far the most popular, but it’s, hm, shall we say technically non-spectacular. There are forks, but the forks have problems too (ask me about BoringSSL! ), so forget about them. The copyright problem here is that the OpenSSL license is incompatible with the GPL. (Boring details: Red Hat waves away this problem by declaring OpenSSL a system library qualifying for the GPL’s system library exception. Debian has declared the opposite, so Red Hat’s choice doesn’t gain you anything if you care about Debian users. The OpenSSL developers are trying to relicense to the Apache license to fix this, but this process is taking forever, and the Apache license is still incompatible with GPLv2, so this would make it impossible to use GPLv2+ software except under the terms of GPLv3+. Yada yada details.) So if you are writing a library that needs to be used by GPL applications, like say GLib or libsoup or WebKit, then it would behoove you to not use OpenSSL. GnuTLS is my favorite from a technical standpoint. Its license is LGPLv2+, which is unproblematic everywhere, but some of its dependencies are licensed LGPLv3+, and that’s uncomfortable for many embedded systems vendors, since LGPLv3+ contains some provisions that make it difficult to deny you your freedom to modify the LGPLv3+ software. So if you rely on embedded systems vendors to fund the development of your library, like say libsoup or WebKit, then you’re really going to want to avoid GnuTLS. NSS is used by Firefox. I don’t know as much about it, because it’s not as popular. I get the impression that it’s more designed for the needs of Firefox than as a Linux system library, but it’s available, and it works, and it has no license problems. So naturally GLib uses NSS to avoid the license issues of OpenSSL and GnuTLS, right? Haha no, it uses a dynamically-loadable extension point system to allow you to pick your choice of OpenSSL or GnuTLS! (Support for NSS was started but never finished.) This is OK because embedded systems vendors don’t use GPL applications and have no problems with OpenSSL, while desktop Linux users don’t produce tivoized embedded systems and have no problems with LGPLv3. So if you’re using desktop Linux and point WebKitGTK+ at an HTTPS address, then GLib is going to load a GIO extension point called glib-networking, which implements all of GIO’s TLS APIs — notably GTlsConnection and GTlsCertificate — using GnuTLS. But if you’re building an embedded system, you simply don’t build or install glib-networking, and instead build a different GIO extension point called glib-openssl, and libsoup will create GTlsConnection and GTlsCertificate objects based on OpenSSL instead. Nice! And if you’re Centricular and you’re building GStreamer for Windows, you can use yet another GIO extension point, glib-schannel, for your native Windows TLS goodness, all hidden behind GTlsConnection so that GStreamer (or whatever application you’re writing) doesn’t have to know about SChannel or OpenSSL or GnuTLS or any of that sad complexity. Now you know why the TLS extension point system exists in GIO. Software licenses! And you should not be surprised to learn that direct use of any of these crypto libraries is banned in libsoup and WebKit: we have to cater to both embedded system developers and to GPL-licensed applications. All TLS library use is hidden behind the GTlsConnection API, which is really quite nice to use because it inherits from GIOStream. You ask for a TLS connection, have it handed to you, and then read and write to it without having to deal with any of the crypto details. As a recap, the layering here is: WebKit -> libsoup -> GIO (GLib) -> glib-networking (or glib-openssl or glib-schannel). So when Epiphany fails to load a webpage, and you’re looking at a TLS-related error, glib-networking is probably to blame. If it’s an HTTP-related error, the fault most likely lies in libsoup. Same for any other GNOME applications that are having connectivity troubles: they all use the same network stack. And there you have it! P.S. The glib-openssl maintainers are helping merge glib-openssl into glib-networking, such that glib-networking will offer a choice of GnuTLS or OpenSSL and obsoleting glib-openssl. This is still a work in progress. glib-schannel will be next! P.S.S. libcurl also gives you multiple choices of TLS backend, but makes you choose which at build time, whereas with GIO extension points it’s actually possible to choose at runtime from the selection of installed extension points. The libcurl approach is fine in theory, but creates some weird problems, e.g. different backends with different bugs are used on different distributions. On Fedora, it used to use NSS, but now uses OpenSSL, which is fine for Fedora, but would be a license problem elsewhere. Debian actually builds several different backends and gives you a choice, unlike everywhere else. I digress. If you’re using Fedora and discovered that WebKitGTK+ is displaying blank pages, the cause is a bad mesa update, mesa-18.2.3-1.fc29. This in turn was caused by a GCC bug that resulted in miscompilation of mesa. On the bright side of things, from all the bug reports I’ve received over the past two days I’ve discovered that lots of people use Epiphany and notice when it’s broken. That’s nice! Huge thanks to Dave Airlie for quickly preparing the fixed mesa update, and to Jakub Jelenik for handling the same for GCC. Last month, I attended the Web Engines Hackfest (hosted by Igalia in A Coruña, Spain) and also the WebKit Contributors Meeting (hosted by Apple in San Jose, California). These are easily the two biggest WebKit development events of the year, and it’s always amazing to meet everyone in person yet again. A Coruña is an amazing city, and every browser developer ought to visit at least once. And the Contributors Meeting is a no-brainer event for WebKit developers. One of the main discussion points this year was Media Source Extensions (MSE). MSE is basically a way for browsers to control how videos are downloaded. Until recently, if you were to play a YouTube video in Epiphany, you’d notice that the video loads way faster than it does in other browsers. This is because WebKitGTK+ — until recently — had no support for MSE. In other browsers, YouTube uses MSE to limit the speed at which video is downloaded, in order to reduce wasted bandwidth in case you stop watching the video before it ends. But with WebKitGTK+, MSE was not available, so videos would load as quickly as possible. MSE also makes it harder for browsers to offer the ability to download the videos; you’ll notice that neither Firefox nor Chrome offer to download the videos in their context menus, a feature that’s been available in Epiphany for as long as I remember. So that sounds like it’s good to not have MSE. Well, the downside is that YouTube requires it in order to receive HD videos, to avoid that wasted bandwidth and to make it harder for users to download HD videos. And so WebKitGTK+ users have been limited to 720p video with H.264 and 480p video with WebM, where other browsers had access to 1080p and 1440p video. I’d been stuck with 480p video on Fedora for so long, I’d forgotten that internet video could look good. Unfortunately, WebKitGTK+ was quite late to implement MSE. All other major browsers turned it on several years ago, but WebKitGTK+ dawdled. There was some code to support MSE, but it didn’t really work, and was disabled. And so it came to pass that, in September of this year, YouTube began to require MSE to access any WebM video, and we had a crisis. We don’t normally enable major new features in stable releases, but this was an exceptional situation and users would not be well-served by delaying until the next release cycle. 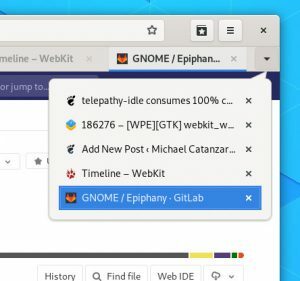 So within a couple weeks, we were able to release WebKitGTK+ 2.22.2 and Epiphany 3.30.1 (both on September 21), and GStreamer 1.14.4 (on October 2, thanks to Tim-Philipp Müller for expediting that release). Collectively, these releases enabled basic video playback with MSE for users of GNOME 3.30. And if you still use of GNOME 3.28, worry not: you are still supported and can get MSE if you update to Epiphany 3.28.5 and also have the aforementioned versions of WebKitGTK+ and GStreamer. MSE in WebKitGTK+ 2.22.2 had many rough edges because it was a mad rush to get the feature into a minimally-viable state, but those issues have been polished off in 2.22.3, which we released earlier this week on October 29. Be sure you have WebKitGTK+ 2.22.3, plus GStreamer 1.14.4, for a good experience on YouTube. Unfortunately we can’t provide support for older software versions anymore: if you don’t have GStreamer 1.14.4, then you’ll need to configure WebKitGTK+ with -DENABLE_MEDIA_SOURCE=OFF at build time and suffer from lack of MSE. Epiphany 3.28.1 uses WebKitSettings to turn on the “enable-mediasource” setting. Turn that on if your application wants MSE now (if it’s a web browser, it certainly does). This setting will be enabled by default in WebKitGTK+ 2.24. Huge thanks to the talented developers who made this feature possible! Enjoy your 1080p and 1440p video. When building WebKitGTK+, it’s a good idea to stick to the default values for the build options. If you’re building some sort of embedded system and really know what you’re doing, then OK, it might make sense to change some settings and disable some stuff. But Linux distros are generally well-advised to stick to the defaults to avoid creating problems for users. One exception is if you need to disable certain features to avoid newer dependencies when building WebKit for older systems. For example, Ubuntu 18.04 disables web fonts (ENABLE_WOFF2=OFF) because it doesn’t have the libbrotli and libwoff2 dependencies that are required for that feature to work, hence some webpages will display using subpar fonts. And distributions shipping older versions of GStreamer will need to disable the ENABLE_MEDIA_SOURCE option (which is missing from the below feature list by mistake), since that requires the very latest GStreamer to work. Other exceptions are the ENABLE_GTKDOC and ENABLE_MINIBROWSER settings, which distros do want. ENABLE_GTKDOC is disabled by default because it’s slow to build, and ENABLE_MINIBROWSER because, well, actually I don’t know why, you always want that one and it’s just annoying to find it’s not built. OK, but really now, other than those exceptions, you should probably leave the defaults alone. And, asides from the exceptions noted above, those are probably the options you want to ship with. Why are some things disabled by default? ENABLE_ACCELERATED_2D_CANVAS is OFF by default because it is experimental (i.e. not great :) and requires CairoGL, which has been available in most distributions for about half a decade now, but still hasn’t reached Debian yet, because the Debian developers know that the Cairo developers consider CarioGL experimental (i.e. not great!). Many of our developers use Debian, and we’re not keen on having two separate sets of canvas bugs depending on whether you’re using Debian or not, so best keep this off for now. ENABLE_GLES2 switches you from desktop GL to GLES, which is maybe needed for embedded systems with crap proprietary graphics drivers, but certainly not what you want when building for a general-purpose distribution with mesa. Then ENABLE_QUARTZ_TARGET is for building on macOS, not for Linux. And then we come to USE_SYSTEM_MALLOC. USE_SYSTEM_MALLOC disables WebKit’s bmalloc memory allocator (“fast malloc”) in favor of glibc malloc. bmalloc is performance-optimized for macOS, and I’m uncertain how its performance compares to glibc malloc on Linux. Doesn’t matter really, because bmalloc contains important heap security features that will be disabled if you switch to glibc malloc, and that’s all you need to know to decide which one to use. If you disable bmalloc, you lose the Gigacage, isolated heaps, heap subspaces, etc. I don’t pretend to understand how any of those things work, so I’ll just refer you to this explanation by Sam Brown, who sounds like he knows what he’s talking about. The point is that, if an attacker has found a memory vulnerability in WebKit, these heap security features make it much harder to exploit and take control of users’ computers, and you don’t want them turned off. USE_SYSTEM_MALLOC is currently enabled (bad!) in openSUSE and SUSE Linux Enterprise 15, presumably because when the Gigacage was originally introduced, it crashed immediately for users who set address space (virtual memory allocation) limits. Gigacage works by allocating a huge address space to reduce the chances that an attacker can find pointers within that space, similar to ASLR, so limiting the size of the address space prevents Gigacage from working. At first we thought it made more sense to crash than to allow a security feature to silently fail, but we got a bunch of complaints from users who use ulimit to limit the address space used by processes, and also from users who disable overcommit (which is required for Gigacage to allocate ludicrous amounts of address space), and so nowadays we just silently disable Gigacage instead if enough address space for it cannot be allocated. So hopefully there’s no longer any reason to disable this important security feature at build time! Distributions should be building with the default USE_SYSTEM_MALLOC=OFF. which all looks pretty reasonable to me: certain features that require “newer” dependencies are disabled on the old distros, and NPAPI plugins are not supported in the enterprise distro, and JIT doesn’t work on odd architectures. I would remove the ENABLE_JIT=OFF lines only because WebKit’s build system should be smart enough nowadays to disable it automatically to save you the trouble of thinking about which architectures the JIT works on. And I would also remove the -DUSE_SYSTEM_MALLOC=ON line to ensure users are properly protected. Tuesday, July 10: a bad runtime build is published. Trying to start any application results in error while loading shared libraries: libdw.so.1: cannot open shared object file: No such file or directory. Problem is the library is present in org.gnome.Sdk instead of org.gnome.Platform, where it is required. Saturday, July 14: having returned from GUADEC, I notice the bug report and bisect the issue to a particular runtime build. Mathieu Bridon fixes the issue in the freedesktop SDK and opens a merge request. Monday, July 16: Mathieu’s fix is committed. We now have to wait until Tuesday for the next build. Saturday, July 21: the successful build is now available. The problem is fixed. As far as I know, it was not possible to run any nightly applications during this two week period, except developer applications like Builder that depend on org.gnome.Sdk instead of the normal org.gnome.Platform. If you used Epiphany Technology Preview and wanted a functioning web browser, you had to run arcane commands to revert to the last good runtime version. This multi-week response time is fairly typical for us. We need to improve our workflow somehow. It would be nice to be able to immediately revert to the last good build once a problem has been identified, for instance. Meanwhile, even when the runtime is working fine, some apps have been broken for months without anyone noticing or caring. Perhaps it’s time for a rethink on how we handle nightly apps. It seems likely that only a few apps, like Builder and Epiphany, are actually being regularly used. The release team has some hazy future plans to take over responsibility for the nightly apps (but we have to take over the runtimes first, since those are more important), and we’ll need to somehow avoid these issues when we do so. Having some form of notifications for failed builds would be a good first step. P.S. To avoid any possible misunderstandings: the client-side Flatpak technology itself is very good. It’s only the server-side infrastructure that is problematic here. Clearly we have a lot to fix, but it won’t require any changes in Flatpak. I don’t often write useless blog posts, but today will be an exception. The address sanitizer (asan) is a ludicrously good tool. The developers deserve a huge thank you. There are other good sanitizers too, but asan is what I have been using recently. If you use Epiphany Technology Preview, please update immediately and ensure you have revision 3.29.2-26 or newer. We discovered and resolved a vulnerability that allowed websites to access internal Epiphany features and thereby exfiltrate passwords from the password manager. We apologize for this oversight. The unstable Epiphany 3.29.2 release is the only affected release. Epiphany 3.29.1 is not affected. Stable releases, including Epiphany 3.28, are also not affected. There is no reason to believe that the issue was discovered or exploited by any attackers, but you might wish to change your passwords if you are concerned. It’s been four months since I announced Epiphany Technology Preview — which I’ve been using as my main browser ever since — and five months since I announced the availability of a stable channel via Flatpak. For the most part, it’s been a good experience. Having the latest upstream development code for everything is wonderful and makes testing very easy. 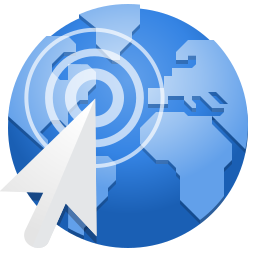 Any user can painlessly download and install either the latest stable version or the bleeding-edge development version on any Linux system, regardless of host dependencies, either via a couple clicks in GNOME Software or one command in the terminal. GNOME Software keeps it updated, so I always have a recent version. Thanks to this, I’m often noticing problems shortly after they’re introduced, rather than six months later, as was so often the case for me in the past. Plus, other developers can no longer complain that there’s a problem with my local environment when I report a bug they can’t reproduce, because Epiphany Technology Preview is a canonical distribution environment, a ground truth of sorts. There have been some rough patches where Epiphany Technology Preview was not working properly — sometimes for several days — due to various breaking changes, and the long time required to get a successful SDK build when it’s failing. For example, multimedia playback was broken for all of last week, due to changes in how the runtime is built. H.264 video is still broken, since the relevant Flatpak extension is only compatible with the 3.28 runtime, not with master. Opening files was broken for a while due to what turned out to be a bug in mutter that was causing the OpenURI portal to crash. I just today found another bug where closing a portal while visiting Slack triggered a gnome-shell crash. For the most part, these sorts of problems are expected by testers of unstable nightly software, though I’m concerned about the portal bugs because these affect stable users too. Anyway, these are just bugs, and all software has bugs: they get fixed, nothing special. So my impression of Flatpak is still largely positive. Flatpak does not magically make our software work properly in all host environments, but it hugely reduces the number of things that can go wrong on the host system. In recent years, I’ve seen users badly break Epiphany in various ways, e.g. by installing custom mimeinfo or replacing the network backend. With Flatpak, either of these would require an incredible amount of dedicated effort. Without a doubt, Flatpak distribution is more robust to user error. Another advantage is that we get the latest versions of OS dependencies, like GStreamer, libsoup, and glib-networking, so we can avoid the many bugs in these components that have been fixed in the years since our users’ LTS distros froze the package versions. I appreciate the desire of LTS distros to provide stability for users, but at the same time, I’m not impressed when users report issues with the browser that we fixed two years ago in one dependency or another. Flatpak is an excellent compromise solution to this problem: the LTS distro retains an LTS core, but specific applications can use newer dependencies from the Flatpak runtime. But there is one huge downside to using Flatpak: we lose crash reports. It’s at best very difficult — and often totally impossible — to investigate crashes when using Flatpak, and that’s frankly more important than any of the gains I mention above. For example, today Epiphany Technology Preview is crashing pretty much constantly. It’s surely a bug in WebKit, but that’s all I can figure out. The way to get a backtrace from a crashing app in flatpak is to use coredumpctl to manually dump the core dump to disk, then launch a bash shell in the flatpak environment and manually load it up in gdb. The process is manual, old-fashioned, primitive, and too frustrating for me by a lot, so I wrote a little pyexpect script to automate this process for Epiphany, thinking I could eventually generalize it into a tool that would be useful for other developers. It’s a horrible hack, but it worked pretty well the day I tested it. I haven’t seen it work since. Debuginfo seems to be constantly broken, so I only see a bunch of ?? ?s in my backtraces, and how are we supposed to figure out how to debug that? So I have no way to debug or fix the WebKit bug, because I can’t get a backtrace. The broken, inconsistent, or otherwise-unreliable debuginfo is probably just some bug that will be fixed eventually (and which I half suspect may be related to our recent freedesktop SDK upgrade. Update: Alex has debugged the debuginfo problem and it looks like that’s on track to be solved), but even once it is, we’re back to square one: it’s still too much effort to get the backtrace, relative to developing on the host system, and that’s a hard problem to solve. It requires tools that do not exist, and for which we have no plans to create, or even any idea of how to create them. So the developer experience is just not good, but set that aside: the main benefits of Flatpak are for users, not developers, after all. Now, what if users run into a crash, how can they report the bug? Crash reports are next to useless without a backtrace, and wise developers refuse to look at crash reports until a quality backtrace has been posted. So first we need to fix the developer experience to work properly, but even then, it’s not enough: we need an automatic crash reporter, along the lines of ABRT or apport, to make reporting crashes realistically-achievable for users, as it already is for distro-packaged apps. But this is a much harder problem to solve. Such a tool will require integration with coredumpctl, and I have not the faintest clue how we could go about making coredumpctl support container environments. Yet without this, we’re asking application developers to give up their most valuable data — crash reports — in order to use Flatpak. Eventually, if we don’t solve crash reporting, Epiphany’s experiment with Flatpak will have to come to an end, because that’s more important to me than the (admittedly-tremendous) benefits of Flatpak. I’m still hopeful that the ingenuity of the Flatpak community will find some solutions. We’ll see how this goes.